NASA launched a novel project in April, putting into orbit three satellites that employ an off-the-shelf commercial smartphone as the control system. The satellites hitched a ride on the maiden flight of Orbital Science Corp.'s Antares rocket from NASA's Wallops Island Flight Facility in Virginia. Each of the three "phonesats" was a 10-centimeter cube with a mass of about 1 kilogram. The trio operated in orbit for about a week, transmitting back down to Earth. The satellite orbits naturally decayed after about one week, as expected, and they re-entered Earth's atmosphere on April 27. According to Chad Frost, chief of the Mission Design Division at NASA's Ames Research Center, the success of the mission was an important milestone. Building a spacecraft of any sort generally means using very expensive hardware and software, Frost said. But PhoneSat -- comparatively very inexpensive -- breaks the mold. According to Frost, this concept could be used to deploy groups of satellites to, for example, monitor space weather or conditions in various parts of the Earth. "We were very intrigued by the notion that you could build a very low-cost spacecraft based entirely on a smartphone and other consumer electronics devices," he said. 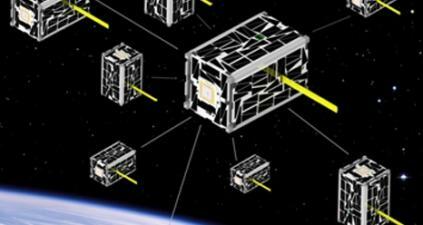 A swarm of advanced and affordable nanosatellites for a coordinated science mission demonstration. The PhoneSat project -- which won Popular Science's 2012 Best of What's New Award for innovation in aerospace -- proved exactly what Frost and his colleagues at NASA had hoped for: "That you can build a spacecraft for orders of magnitude less" than what it typically takes. Frost said NASA is now seriously looking at several PhoneSat concepts that could include hundreds or even thousands of spacecraft working in conjunction to provide, for example, a space weather early warning system or other such networks for monitoring. Since the PhoneSat project utilizes the Android operating system, it opens up the possibility of apps being created by the global Android developer community being used in space, Frost said. He called the concept "wide open and wildly exciting." The idea of basing a satellite on a smartphone wouldn't be possible without advances made in smartphones over the past few years, Frost noted. "We've driven consumer electronics to the point where they are just amazingly capable little devices and ridiculously affordable for what they can do," he said. Frost has been at the forefront of aerospace technology for more than 25 years. He joined the Army/NASA joint rotorcraft division in 1997. In his years at NASA, both electronics and spacecraft technology have come a long way. "I'm part of the generation that first started to get their hands on the first computers," Frost said. He added that some of the earliest projects he worked on as an engineer still used analog control systems. The fundamental revolution, he said, beginning with Apollo, was the move to digital flight control. The culmination of the digital revolution is "flying these smartphones and other systems that have amazing computational power, ridiculously low power consumer, and are insanely inexpensive," Frost said. "I see the revolution in electronics as being the thing that has most fundamentally transformed what we can do and what we will be able to do in the future," he said. "There are other things coming along that will be very exciting and powerful, but I don't know that they will dominate the landscape the way microelectronics can."